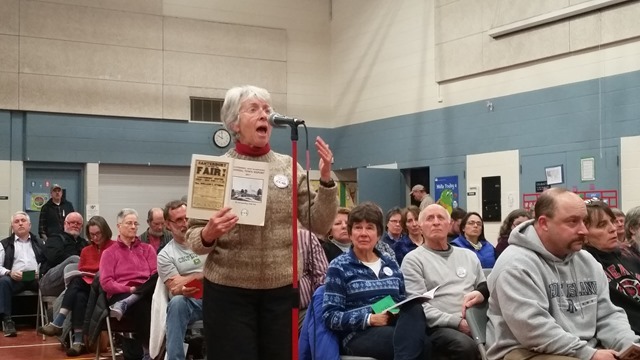 Voters at the annual town meeting in Canterbury, New Hampshire, meeting in the town’s elementary school gym on March 16, approved a resolution calling for a shift in federal spending away from the Pentagon and toward other purposes. The resolution was the final item on the agenda of the annual exercise of direct democracy still practiced by small town in New England. It calls on the United States Congress to “cut the Pentagon budget and to use that money to fund education, public and private sector family-sustaining job creation, environmental and infrastructure restoration, care for veterans and their families, and human services that our communities and state desperately need, and create tax cuts for working families.“ The resolution also directs the town’s Board of Selectmen to forward it to the state’s two US Senators and the district’s US Representative as a statement of the town’s views. · the U.S. is the wealthiest nation on earth but trails many other nations in life expectancy, infant mortality, education-level, housing, and clean air and water. The resolution was printed in the town’s Annual Report, which voters consulted during the course of the meeting. The CC4D members also produced a 4-page fact sheet, with colored charts illustrating the points in the resolution, and placed them on chairs throughout the gym before the meeting started. “There’s very little debate in Congress over military spending, and there should be a lot more. That’s the purpose behind this resolution,” Taylor told the roomful of Canterbury residents. The practice at town meeting is for any resident to take the microphone and offer an opinion or a question on each item. By the time Taylor introduced the federal spending resolution, the meeting had already approved the leasing of police cruisers, the purchase of a new truck for the highway department, creation of a committee to advise the town on how to reduce use of fossil fuels, and the town budget for the coming year, including a raise for the Town Administrator. Voters rejected a proposal from the Board of Selectmen to make the town treasurer position an appointed one rather than an elected office. With the hour late, only three people took the microphone to speak to the budget resolution. “What we need to feel safe is for our citizens to feel like they have a Iivelihood that will support them, that they have health care, that their children can have a future. The only way I can see that we can start doing that and start feeling safe in our lives is to start this discussion about tipping the balance of our spending,” she added. There was one dissenter, who began his speech by saying, “I love the internet, I can pretty much find anything to support any view I take.” He then cited an alternate set of statistics he said showed that Russia and China actually spend more on their military programs when issues like the differing costs of weapons production are taken into account. Following a motion to “move the question” and end debate, the moderator read out the resolution’s conclusion one more time. “You’ll forgive me if I don’t read the whereases,” he said, drawing chuckles from the crowd. Then he asked voters to raise green “yes” cards to support the resolution or red “no” cards if they opposed it. The green cards were clearly in the majority. “The motion passes,” the moderator declared. 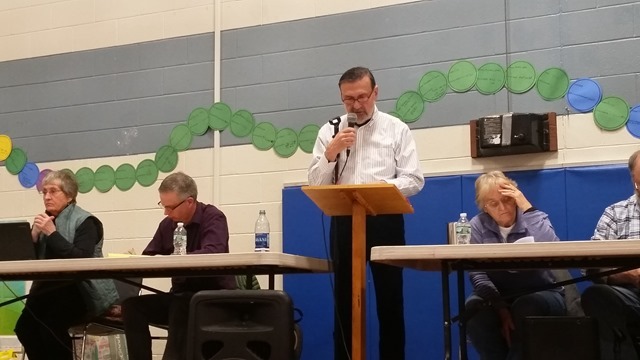 After some more discussion on the re-building of the Sam Lake House, where the town offices are located, and a report on the results of a survey about the town’s recycling center, the 2018 Canterbury Town Meeting was declared over. Canterbury voters will meet again on the first Friday after the second Tuesday of March, 2019. By then, their two US Senators and their US Representative will have heard that voters in this small, New Hampshire town want them to make a dramatic change in how their federal tax dollars are spent. Democracy or Oligarchy, Which is It? If the “central characteristic of democracy is responsiveness of government to the interests of citizens,” as Martin Gilens says, then ours is failing miserably. Professor Gilens, prime author of a much-cited article showing that the US government responds to the interests of wealthy individuals and corporate lobbies, not to ordinary people, presented his findings tonight at Plymouth State University. Gilens, a professor of political science at Princeton, analyzed responses to 1779 survey questions collected from 1981 to 2002 to test whose opinions mattered. With his co-author, Benjamin Page, Gilens examined the views of average citizens, defined as those at median levels of income, the views of wealthy individuals, and the positions held by the most powerful interest groups ( “Most of them are business oriented,” he said.). Then they looked at the outcomes of policy debates. 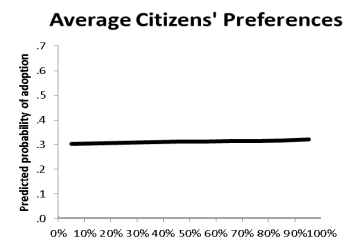 What they found is that the preferences of ordinary people have virtually no impact on policy. The opinions of wealthy individuals and organized interest groups, however, have a considerable effect. “People with resources call the shots and ordinary citizens are bystanders,” he said. not the priorities of our government,” Gilens said. 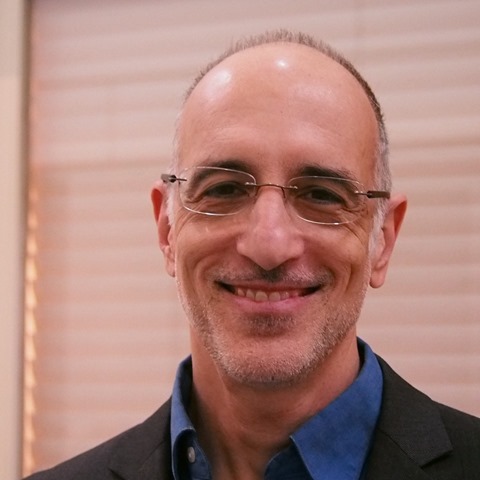 Gilens’ research was reported in “Testing Theories of American Politics: Elites, Interest Groups, and Average Citizens,” published in 2014 in Perspectives on Politics. Frequently referred to as “the Princeton study,” the Gilens and Page paper has been used to state the USA is now an oligarchy. Not so fast, Gilens says. Yes, it’s true that ordinary people are largely ignored and that high percentages of the rising amounts of cash flooding the political system come from a relatively small collection of wealthy individuals. And it’s also true that running and winning elections demands ever larger campaign funds. But Gilens holds onto hope that a movement like the early 20th century progressives can rise up to challenge the policies of the New Gilded Age. “No single reform” will do it, Gilens believes. But campaign finance reform, lobbying reform, electoral reform, and the rise of civil society and labor groups just might stop the trend toward oligarchy. That will be “a decades long task,” he says. This morning’s Concord Monitor had a letter to the editor from Tonya Angwin, president of the Shaker Regional Educational Association, the union representing teachers and school staff in the district where we live. As she reported, the union had reached an agreement for a new contract with the negotiating team for the School District, but the school board voted it down. “The school board has placed us in a difficult situation by refusing to include money for our contract in its proposed budget. As a result, the SREA must ask district members tonight to amend the budget to include money needed to support a reasonable contract,” she wrote. 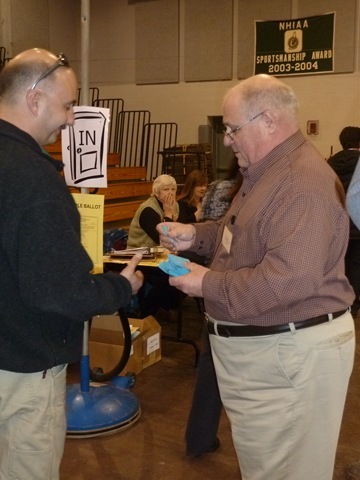 Like traditional New England Town Meetings, the annual meetings of New Hampshire School districts are small-d democratic. We often skip School District meetings, but tonight we decided to go. A couple hundred people gathered in the Belmont High School gym. At the beginning of the meeting, Roy Roberts, the Moderator, asked everyone present who was not a registered voter in Belmont or Canterbury to raise their hands so we would all know who was not entitled to vote. Otherwise, we were on the honor system. The budget was Article 4, a proposal for $19,837,324 for the year ‘”for the support of schools, the salaries of school district officials and agents, and for the payment of statutory obligations.” A member of the school board explained this amount constituted a 2% increase over the previous year, but noted there was at present no collective bargaining agreement with the employees. He also noted the uncertainties associated with the chronic debate over education funding in the state legislature. 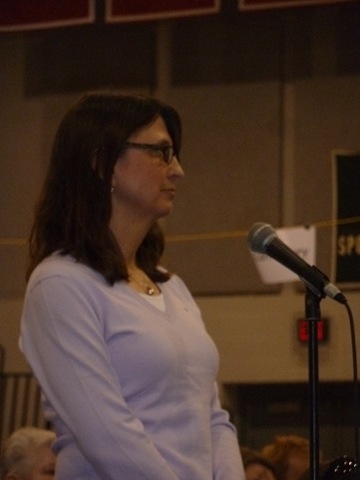 Discussion began with Pat Piscetta, who identified herself as a Belmont taxpayer and a school district employee and asked the school board members why they rejected their own negotiating team’s collective bargaining agreement. Speaking for the board, Sumner Dole said the proposed contract “did not meet the long term interests of what we were trying to attain,” but said he couldn’t be more specific due to confidentiality agreements. Pat Piscetta was not mollified. How can voters understand what is going on if the board refuses to tell them, she asked, then called for money to be set aside for the contract. 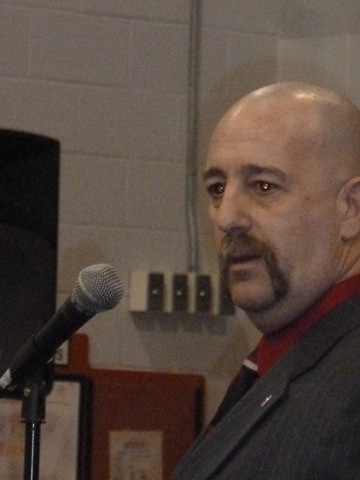 Michael Guglielmo followed with a motion to add $213,380 to the budget to settle the teachers contract and restore custodial and technical positions which had been eliminated. “I’m just here to support the teachers and all our children,” he said. A bit of debate followed, and Pat Piscetta returned to the microphone. “We’re not asking for a raise, just for the step increases,” she said. We voted by a show of hands, counted by the supervisors of the voter checklists. The outcome was a tie, 94 to 94. The moderator broke the tie with a “no” vote, but then said he would entertain a motion to reconsider. Tha t motion was made and adopted. This time the vote came out 116 for the amendment, and 114 against. We’re glad we were there. Now it was time to vote on the amended budget, again by secret ballot. The budget passed, 156 to 75.